AUGUSTA — Hundreds of gun rights activists, advocates for stricter gun laws and law enforcement officials converged Wednesday on the State House to testify on a bill that would eliminate the license requirement for carrying a concealed handgun. The proposal could make Maine one of only seven states that allow individuals to carry a concealed handgun without a permit. The bill has 96 co-sponsors, more than half the members of the Legislature, and the blessing of some members of the Republican and Democratic leadership. • Would allow people to carry a concealed weapon in public without a permit as long as they are not otherwise prohibited from having a gun, because of a criminal record, for example. • Does not change the rights of private property owners to prohibit weapons on their property. • Does not alter bans on bringing a gun into the State House or other specific public places where weapons are prohibited. • Would allow a person to have a loaded pistol or revolver in a car or trailer or other vehicle being towed. While the bill is drawing support across partisan lines, it is also dividing the law enforcement community. Maine State Police endorsed the measure at a legislative hearing, while local departments testified against it and held a news conference to highlight their concerns. “When we roll into a scene, we’re looking for weapons,” Portland Police Chief Michael Sauschuck said during the news conference, speaking on behalf of the city and the Maine Chiefs of Police Association. He was flanked by chiefs and other police officials from Cumberland County. “Common sense would say, why wouldn’t you have a permitting process before allowing someone to conceal a firearm in the community?” Sauschuck said. 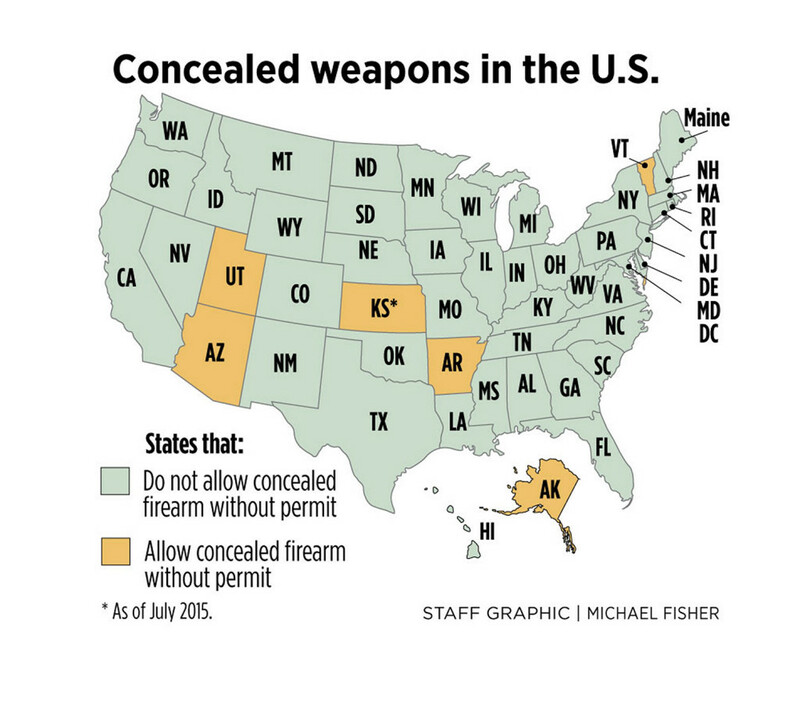 Currently, Alaska, Arizona, Arkansas, Kansas, Utah and Vermont have no restrictions on carrying concealed handguns. Maine State Police said that there are currently 36,000 concealed handgun permits, including 12,000 for non-residents, that have been issued by the state. The total number of permits is likely much higher because they are also issued by local police and there is no centralized registry. Brakey argued that the permitting system creates barriers for law-abiding citizens to exercise their constitutional right to carry a gun. Critics said the bill also would effectively eliminate the screening offered by background checks for certain gun purchases. Maine law currently allows gun owners to openly carry a handgun. However, concealing a handgun requires a permit from state police or local law enforcement. Receiving a permit requires obtaining a gun safety certificate. There is also a “good moral character” requirement and a background check to determine if the applicant is a convicted felon, or has been involved in domestic violence disputes. The screening process is one reason why gun control advocates and several law enforcement organizations opposed the bill, arguing that the permitting process added a layer of safety for law enforcement and the public. Sauschuck, the Portland chief, said he turned down 13 requests for permits in 2012, 23 in 2013 and 11 in 2014. Some of those were from convicted felons, people convicted of domestic violence charges or people who had endangered children. One was a man who asked his young child to hide a loaded gun when police were at the door, Sauschuck said at the news conference. “I believe that had a positive impact on the safety of this community,” Sauschuck said of the permit denials. He said repealing the law also would send the wrong message to drug dealers, who might then legally carry a concealed weapon. However, the Maine Department of Public Safety, which includes the state police, endorsed the proposal Wednesday. The department is overseen by Gov. Paul LePage, who holds a concealed weapons permit. LePage has not explicitly said whether he supports eliminating the permit requirement. Nonetheless, testimony by state police Maj. Christopher Grotton will likely be seen as an endorsement by the LePage administration. Grotton testified that Maine’s permit system is antiquated and that there is no consistent permitting format across the state’s more than 400 municipalities. He also said the permits were not an indicator of safety, adding that state police have rejected 0.006 percent of permit applications, on average. “It’s easy to feel that this is a step away from safety,” Grotton said, but the permit system does not prevent a dangerous person from owning or carrying a gun. He said whether an individual openly carries a gun or hides it does not have a bearing on public safety. “Truly, the measure of whether or not you’re safe is you evaluate people based on their behavior and your instinct, not necessarily whether they’re carrying a gun or not,” he said. Grotton said state police have long supported efforts to overhaul the permit system. That was the department’s position in 2013, when another no-permit bill was narrowly defeated by the Democrat-controlled Legislature. Republicans hold more seats in the Legislature this session, and with 14 Democrats signed on as co-sponsors, the bill is seen as having a better chance of passing. 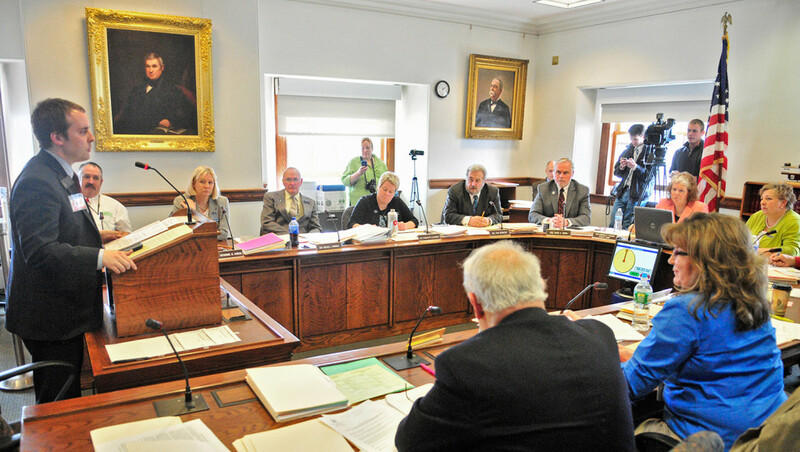 In 2013, lawmakers scrambled to shield the identities of permit holders after the Bangor Daily News requested their names and addresses through the state’s Freedom of Access Act. Since then, lawmakers have resisted efforts to create a centralized permitting system operated by state police. One bill last year would have created a central, confidential permitting system and allowed state police to conduct criminal and mental health background checks. The measure was drafted during more than a year of meetings by interested groups, including law enforcement, the Sportsman’s Alliance of Maine and the National Rifle Association. The NRA eventually backed an amendment that derailed the bipartisan overhaul, a move that some lawmakers criticized as election-year sabotage. Opponents of Brakey’s proposal argued Wednesday that removing the concealed permit requirement would also remove protections, including the background check requirement. If the bill were to pass, a person could carry a concealed weapon purchased in a private sale, where no background checks or waiting periods are required. 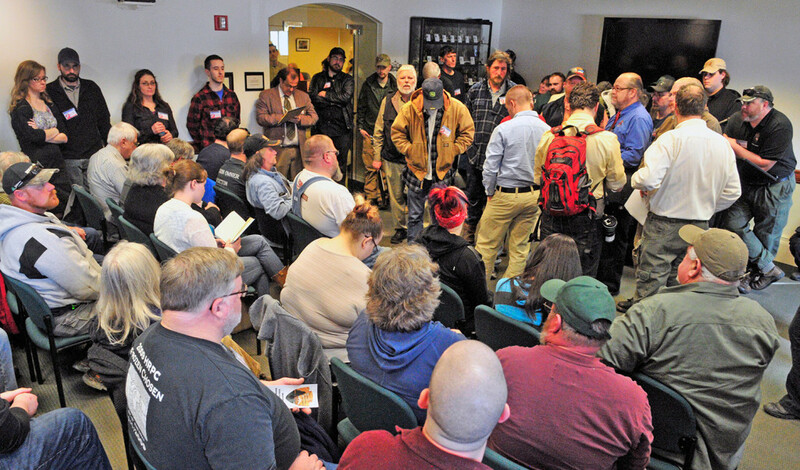 Gun control advocates often raise concerns about Maine’s private gun marketplace. Those advocates and law enforcement officials have long argued that Maine and other states with unregulated private gun sales are an easy source of weapons for criminals or mentally unstable people who couldn’t get a gun from a licensed dealer because they’d be required to pass a background check. State police issued 3,912 concealed weapon permits in 2008, the year Barack Obama, a proponent of gun control, was elected president. The number of permits climbed to 5,706 the next year, and then to 7,574 in 2012, the year of Obama’s re-election. Aggregate figures for permits issued by municipalities are not available, and the state does not track the statistics. FBI figures for background checks in the corresponding years show that in 2008 there were 56,561 background checks sought in Maine through the National Instant Criminal Background Check System, or NICS. There were 60,955 checks in 2009 and 91,834 in 2012. It’s unclear if the increase in background checks is related to an increase in concealed weapons permit applications, which experienced a significant backlog in 2013. Brakey’s proposal was one of seven gun bills that received a public hearing Wednesday. One, a proposal by Rep. Mark Dion, D-Portland, is designed to promote – but not require – background checks on private sales. The bill, L.D. 415, would impose civil penalties on an individual who sells a firearm to someone who later commits a crime. It would be a Class D crime to knowingly sell a weapon to someone who is prohibited from possessing a firearm. Dion, who helped negotiate the permit overhaul bill that failed last year, said his bill would put gun sellers in the position of weighing whether selling the gun without conducting a background check is worth the risk. L.D. 415 and L.D. 823, both proposals to create a central permitting system, likely face the same uphill climb in the Legislature, which has historically rejected any gun legislation that can be perceived as a restriction on Second Amendment rights. Lawmakers on the Criminal Justice and Public Safety Committee will review L.D. 652 at a future work session.